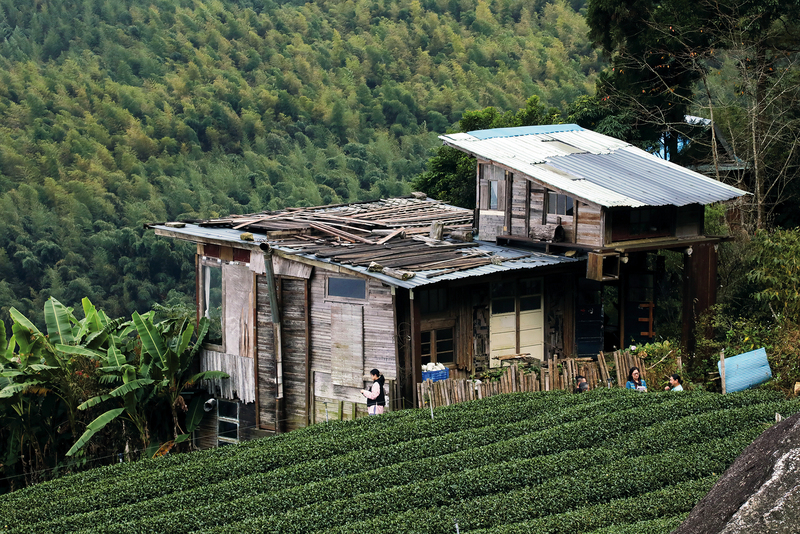 Due to the harm caused to the land by conventional farming methods, in Taiwan more and more tea farmers are turning to natural farming techniques, showing their respect for the land. When you treat the land well, nature will generously reward you. We go with Tsai Yi-tze, founder of the Tea Mountain Preservation Society, to visit an eco-friendly tea plantation in ­Taihe Village on Ali­shan (Mt. Ali), where we discover the beauty of living in harmony with nature. 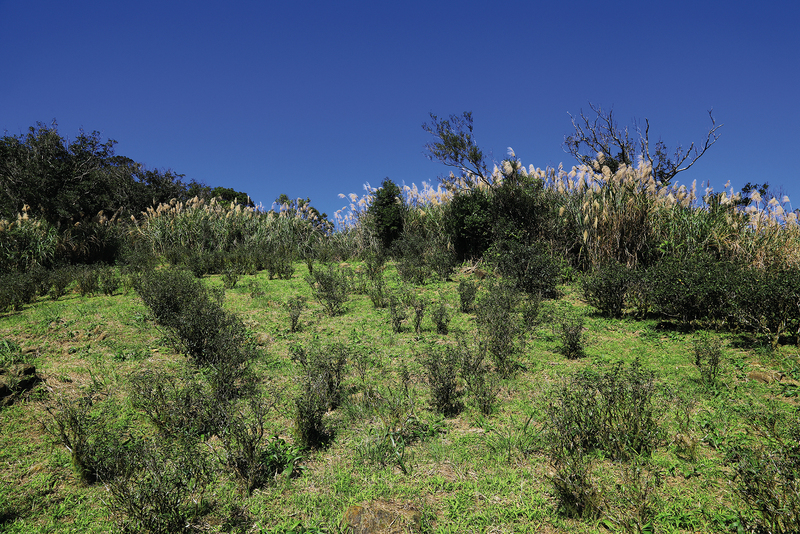 And at an organic tea plantation in Ping­lin, we see in practice the ideal of protecting water resources. 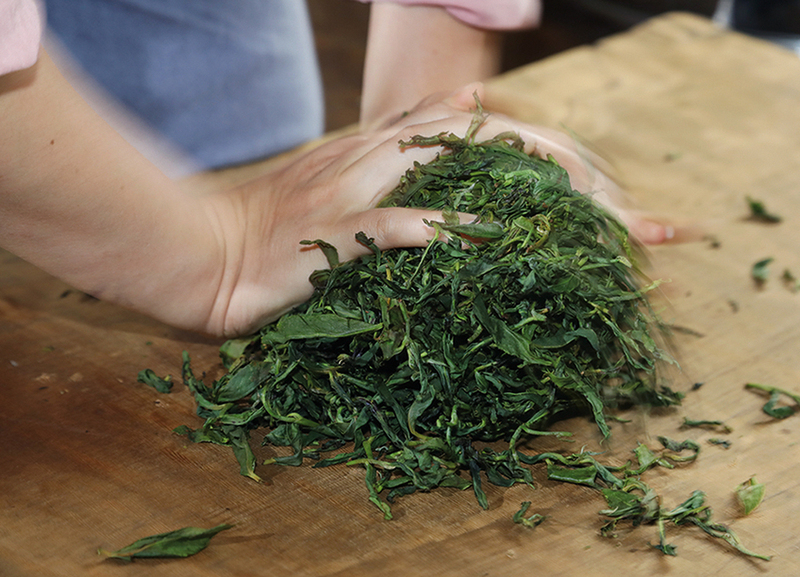 In the tea brewed from leaves picked on an eco-friendly tea farm, you can taste the flavor of the land. After passing Lake ­Fenqi on Provincial Highway 18, we drive along winding mountain roads. Amid Ali­shan’s atmosphere of quiet seclusion, we have the feeling that the bolt-upright, verdant Chinese firs are gradually closing in around us. 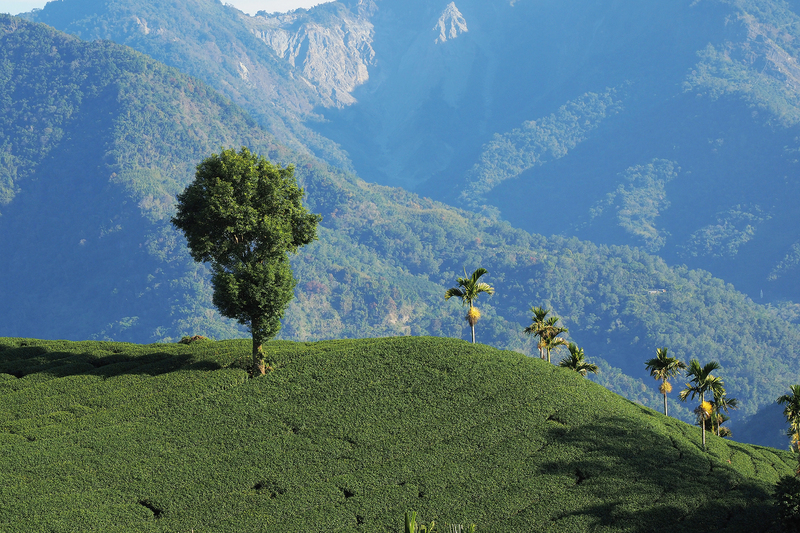 But when we arrive at ­Taihe Village, at an altitude of 1445 meters, suddenly the broad panorama of a large tea plantation opens before our eyes. At a “wild foods” teahouse in a “forest tea garden” deep in the mountains—a teahouse owned by tea farmer Jian Jia­wen that is not open to the public but only receives friends—my understanding of tea plantations is totally overturned. The tea brewed from the leaves of tea plants left to grow free in nature is fragrant and has a rich flavor, and it is very striking that one can still taste the sweetness of the tea even on the seventh or eighth steeping. Jian Jia­wen’s tea plants, including Taiwan mountain tea (Camellia formosensis) and oo­long tea cultivars of Camellia sinensis, are hidden amidst a forest of pigeonwood (Trema orientalis), stout camphor (Cinnamomum kane­hi­rae), and Formosan michelia (Michelia com­pressa) trees. Wild Mexican sunflowers (Tithonia diversifolia) and Alishan chrysanthemums (Dendranthema arisanense) blossom riotously, and the mountain tea trees, their trunks covered with lichen, grow six to 13 meters high, so the leaves can only be picked by climbing up scaffolding set up alongside the trees. The mutual interaction between these tea trees and the natural forest gives their leaves a unique local fragrance. Jian does not prune his tea trees, nor apply fertilizer, nor use pesticides. After ten years of using this natural method of farming, the land has recovered so much that in the tea garden one can see Moltrecht’s green tree frog (Rhacophorus moltrechti), which is highly sensitive to habitat degradation, and predatory spiders that are high up in the food chain, and one can hear the song of birds such as Steere’s liocichla and the white-eared sibia. 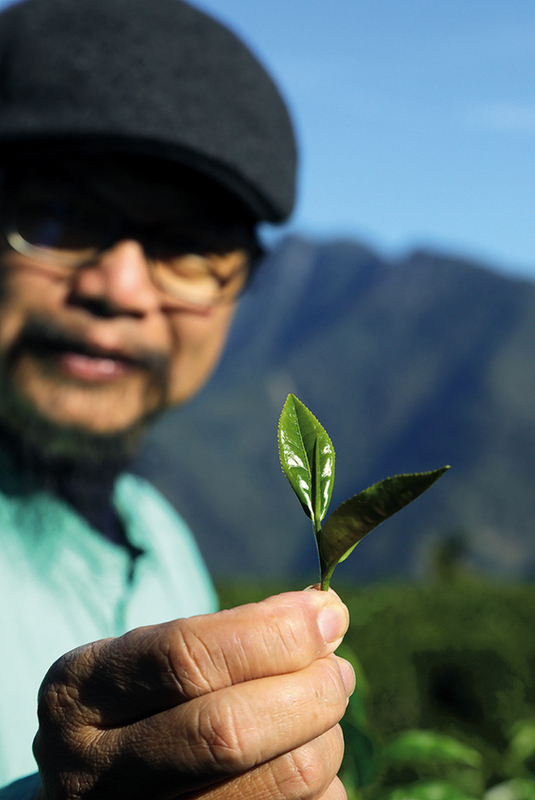 “A diversity of bird, insect, and plant species is the best authentication of an eco-friendly tea plantation,” says tea master Tsai Yi-tze, who is an advocate for eco-friendly tea farming. For tea farmers Jian Jia­wen and Ye Ren­shou, who have adopted natural farming methods, everything started back in 2009 when Typhoon Mo­ra­kot devastated the Ali­shan area. Torrential rains brought a year’s worth of normal precipitation in the space of five days, creating debris flows, rockfalls and landslides. The enormous destruction caused by the typhoon caused some people to rethink man’s relationship with the land and the soil. 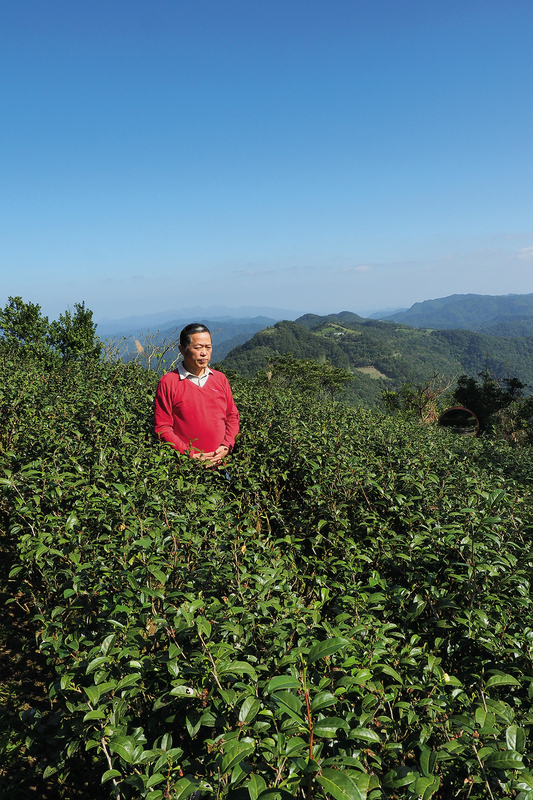 Ignoring the opposition of his family, Jian Jia­wen decided to grow his tea using “wild” methods. For Ye Ren­shou, the initial motivation for adopting natural farming methods also came from Typhoon Mo­ra­kot. Ye saw friends and family killed before his very eyes, and his tea plantation of more than 30 years was carried 200 meters downhill by a debris flow. But the tea trees that now stood untended on someone else’s land still flourished. This opened Ye’s eyes, and he began to try out “wild” growing methods on his own land. Since starting his experiment on 2000 square meters of land, he has since expanded his production of eco-friendly tea fivefold, to one hectare. But through practicing respect for nature through “wild” and natural farming methods, both Jian and Ye came to appreciate the value of peaceful coexistence with nature. They discovered that the power of nature is not only destructive, but can also be life-giving and generous. Take for example Ye’s winter tea crop in 2018. Many farmers who used conventional methods on their plantations saw yields fall as a result of the extremely cold weather. But in Ye’s eco-friendly tea plantation, production actually increased! 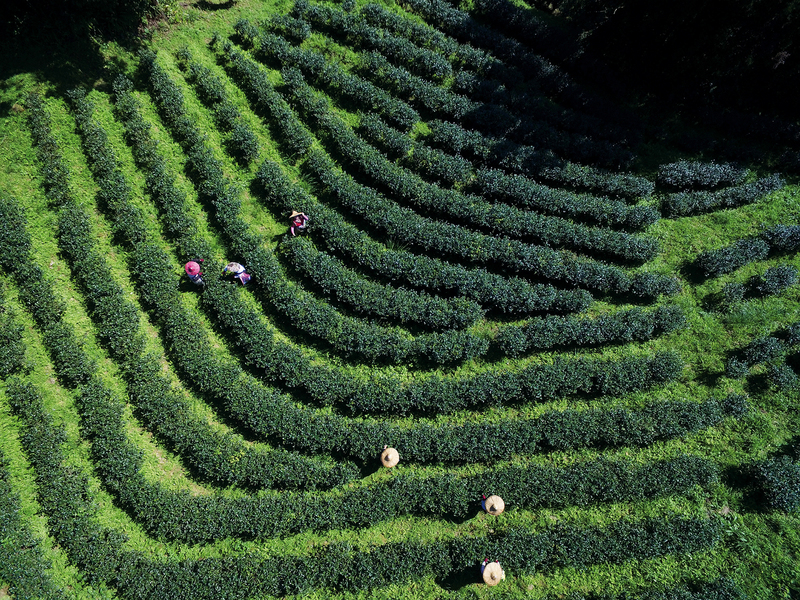 Thanks to years of building soil fertility, the tea trees had grown more resistant to the cold weather. Ye says that eco-friendly tea plantations are better able to resist the impact of changes in local microclimates. 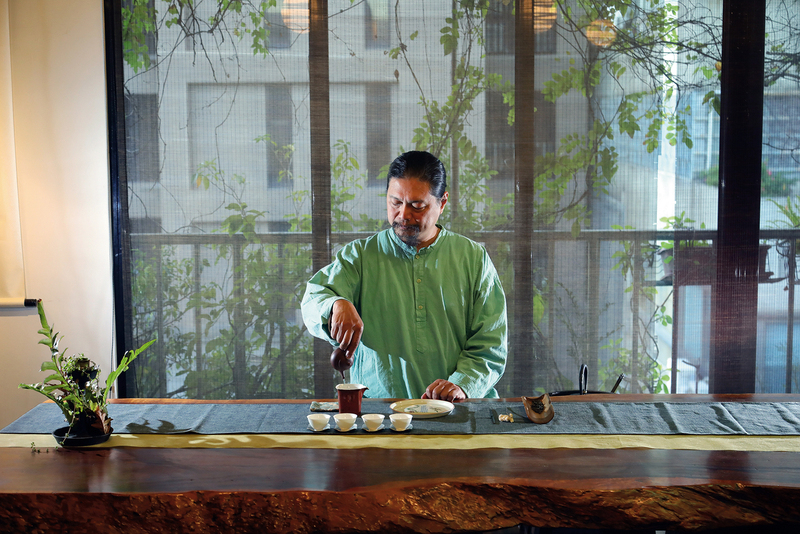 “Drinking tea is drinking the environment.” So says Tsai Yi-tze, a tea master who has been working side by side with tea farmers for over 20 years. In 1996 Tsai happened to be looking for tea to buy in the Bi­shi area of Nan­tou ­County’s ­Xinyi Township when Typhoon Herb caused the Chen­you­lan River to suddenly overflow its banks, and in an instant a debris flow washed away the hut he was standing next to. Fleeing for his life, he was trapped in the mountains, with no outside communication, for more than ten days. 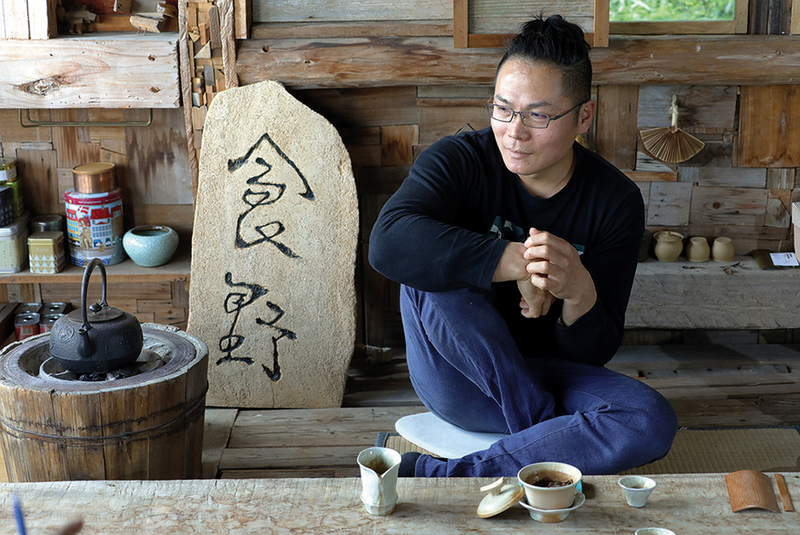 This profound life experience taught Tsai the importance of soil and water conservation, and awoke him to the urgent need to practice it in mountain tea plantations. 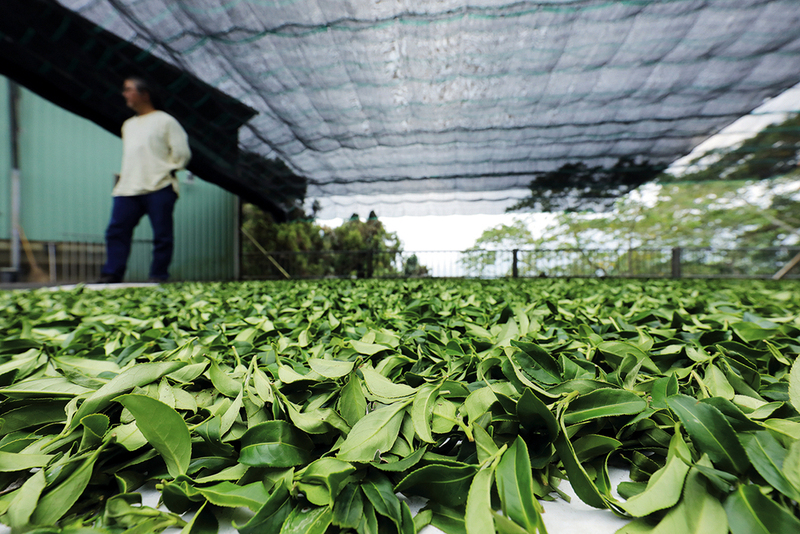 “This conservation effort began with consumer participation and working side by side with tea farmers,” says Tsai, who went through many years of trial and error to arrive at a practical approach. He promoted his ideas to Taiwanese tea growers one patch of land at a time, from Ping­lin to Shi­ding in New Tai­pei City; from Ming­jian to Sun Moon Lake in Nan­tou; and from Ali­shan in ­Chiayi to Gaotai in Tai­­tung. “It was all about working with them and reminding this generation of tea farmers to revive their memories of the tea growing methods of their grandfathers and great-grandfathers, while at the same time restoring the soil to its natural state by not using chemical fertilizers or pesticides.” By adopting natural farming methods, with experience it would be possible to find a balance between production and the environment. The tea farmers who abandoned conventional farming methods were all people with the courage to follow their own convictions, and therefore did not fear to go against the grain. 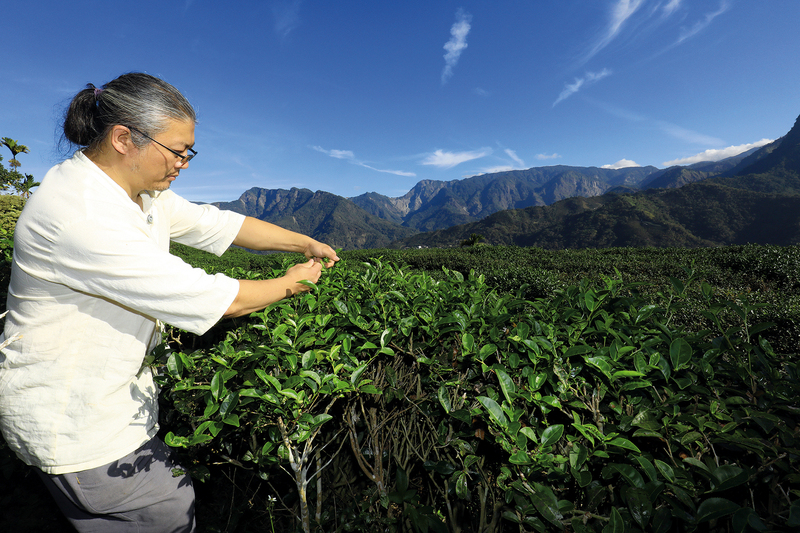 Tea farmer Yu ­Sanhe, head of the seventh tea production and marketing group in Ping­lin, and ­Huang Bo­jun, founder of Taiwan Blue­Mag­pie Tea, both had the same courage and enthusiasm. Yu explains that when he first went over to eco-friendly tea growing, besides a drop in production, his biggest headache was “infections from neighboring plantations.” “Four or five years ago a neighboring farmer said unthinkingly that the only way he could get the leaves on his tea bushes to grow was to spray pesticides three times per growing season. I realized that he was using so much pesticide that the insects were all driven into my plantation, so it’s no wonder that my tea was all eaten up.” To address this problem, Ye did not harvest his tea in August, but deliberately waited until after his neighbors sprayed their pesticides in September, so that his tea leaves would be old and therefore unpalatable to the insects driven over into his plantation. Then he waited again for new buds to form in October, which was precisely the time to harvest winter tea. The difficult days that Yu went through, when reduced production caused him to operate at a loss, so that he could only get by with the help of loans from the farmers’ association, have ended in sweetness. He is understated and persevering, just like the tea he makes—especially his white tea and yellow tea, in which the light infusion has a powerful sweet aftertaste. In the more than 1000 hectares of tea plantations located high up in the catchment of the Fei­tsui Reservoir, spread across Ping­lin and Shi­ding Districts, more than 90% of growers still use conventional methods, and their long-term overuse of chemical fertilizers and pesticides has led to acidification of the land and to concerns about accel­er­ating eu­trophic­ation of the reser­voir. Besides Yu Sanhe, there are some 30 tea farmers in Ping­lin’s organic­-only seventh and eighth production and marketing groups who are working hard to restore eco-friendly tea cultivation, and so to moderate the damage being done to the Fei­tsui Reservoir by conventional farming methods. There is also ­Huang Bo­jun, founder of Taiwan BlueMagpie Tea, who since 2013 has used the concept of “river basin recovery” to convince 14 tea farmers to join the ranks of those who do not use pesticides or chemical fertilizers. Huang uses “eco-friendly” as a branding tool, and promotes marketing techniques like corporate sponsorship and travel to tea growing areas, working through companies with a sense of corporate social responsibility and through consumer participation to together do whatever they can on behalf of environmentally friendly tea drinking. 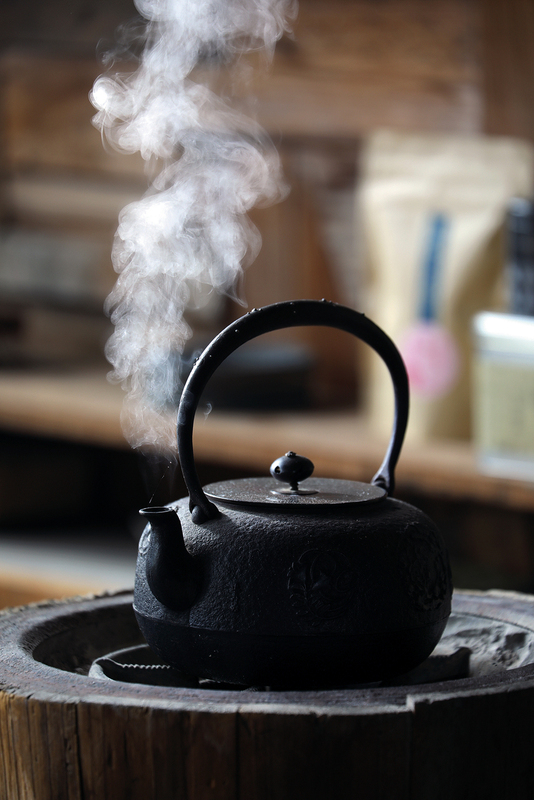 Drinking tea is a reconstruction of natural local conditions, and also a kind of life aesthetic and attitude. When we practice conservation and environmentally friendly cultivation techniques in mountain tea plantations, nature rewards us with a truly revitalizing cup of tea.